FUTURE STORIES IS a monthly podcast from TheJournal.ie and Volkswagen. This month, we’re looking ahead to the future of housework and cleaning. Tracy Tough meets Mark Oleynik, the man behind the world’s first robotic kitchen, speaks to Professor John Barrett of CIT’s Nimbus Research Centre, and visits a new Dublin hotel with its own robot butlers. The first ever electric powered washing machine was invented in 1908. It was called the Thor, and consisted of a freestanding metal cylinder, which could spin by itself. The Thor was a gamechanger for homeowners, who no longer had to wash, rinse and wring clothes by hand. Even now, 110 years on, most washing machines still use the Thor’s spinning-drum concept, with clothes loaded by hand. But could that be about to change? And could you soon be living in a home that does all of your housework for you? Most home appliances still require a human user to operate and supervise them (dishwashers, vacuum cleaners, ovens), which is a problem Mark Oleynik of Moley Robotics wanted to solve with the world’s first ever robotic kitchen. According to its website, the Moley kitchen “cooks with the skill and flair of a master chef.” Literally, a master chef, in the form of BBC MasterChef winner Tim Anderson, whose hand movements form the basis of the kitchen’s robotic arms. “My talent is not in the cooking area, so I tried make it possible for people like me to eat freshly cooked food,” Oleynik tells Tracy Tough in the latest episode of Future Stories. But if you’re happy to cook meals without the help of a robot, you could still be able to hand over household tasks like cleaning up or buying new groceries to your personalised smart home system. “More and more, the things we come into contact with in our everyday lives will start to be connected to the internet,” says Professor John Barrett of the Nimbus Research Centre at Cork Institute of Technology. Professor Barrett predicts a hyper-connected society, where homes will know not only our own preferences, but the likes and dislikes of our guests, too. Your home could collect weather data, or data from your appointment book and know when you have people visiting. And when you come home, the heating is on earlier because you have a friend visiting who prefers a higher temperature. You’ve agreed upfront that you’ll share the information of your community of friends. Email “Sick of doing the dishes? Ask the dishes to do themselves: Here's what the future of cleaning up looks like”. Feedback on “Sick of doing the dishes? 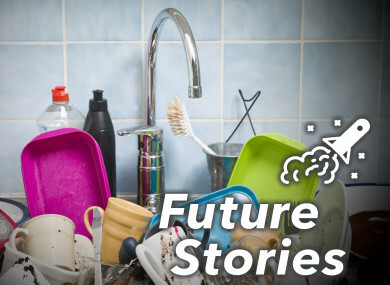 Ask the dishes to do themselves: Here's what the future of cleaning up looks like”.